Casinos with games from Rival Gaming offer a nice change from the games you see at so many casino. Rival has just introduced a funny new farmyard-themed slot game called Windy Farm and Slots Capital and Desert Nights casinos are both giving a $10 Freebie and a 300% deposit bonus to anyone that wants to take it for a spin. 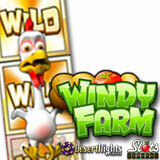 Windy Farm is a 50 payline game with colorful farm animals spinning on its reels. Its Expanding Wild symbol hilarious. It's a comical Chicken that expands up or down on its reel depending on how windy it is. If it’s calm it expands downward, windy and it expands to the top of the reel. Hit three or more raging Bull symbols and win 25 free spins. New farm theme slot game has expanding Wild. Until October 19th you can claim a $10 freebie to try Windy Farm. This bonus must be used within an hour of receiving it. You can also get a 300% deposit bonus using bonus code WINDY300. Windy Farm is the latest of many full-featured slots and casino games available in the download, instant play, and mobile casinos at Slots Capital Casino and Desert Nights Casino. Last month they both unveiled the undersea odyssey, the Rise of Poseidon slot game.